On the occasion of the 40th anniversary of China’s reform and opening up, 40 foreigners were selected for a distinguished award by the Foreign Expert Medal of China’s State Administration of Foreign Experts Affairs. After local recommendations, public voting, and expert review the list with the 40 laureates was finally presented by Lu Ming of the Ministry of Science and Technology at the China International Talent Exchange Conference held in Shenzhen in April 2018. 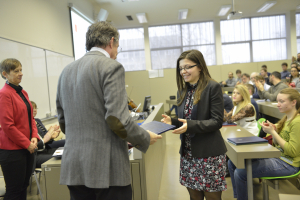 Among them is Dr. Romano A. Rupp, currently working as a guest researcher at the Jozef-Stefan Institute in Ljubljana. 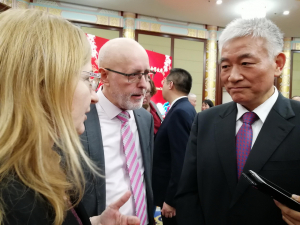 He received the medal dedicated to the “Most Influential Foreign Experts during 40 Years of China’s Reform” from Zhang Jianguo, Deputy Minister of Science and Technology, during the Chinese New Year Reception in Beijing on January 27, 2019. 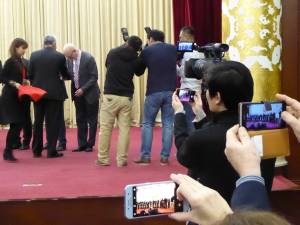 Dr. Rupp receives the award by Zhang Jianguo, Deputy Minister of Science. 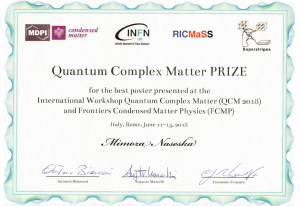 He is an expert in nonlinear optics and a distinguished researcher. He was the winner of the Sanqin Friendship Award. 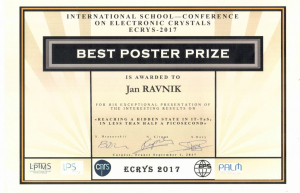 His research results won much attention and positive evaluations from the international scientific community and thus contributed to the enhancement of the academic level and the international reputation of the Institute of Optics and Precision Mechanics of the Chinese Academy of Sciences. http://www-f7.ijs.si/wp-content/uploads/2018/12/logo-modra.png 0 0 Špela Križ http://www-f7.ijs.si/wp-content/uploads/2018/12/logo-modra.png Špela Križ2019-02-21 20:08:302019-02-25 11:19:19Dr. 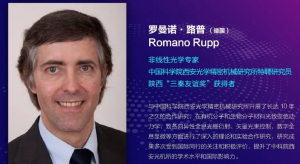 Romano A. Rupp received the medal dedicated to the "Most Influential Foreign Experts during 40 Years of China’s Reform"
On Friday, 18th January, 2019, the Dean of the University of Ljubljana Faculty of Mathematics and Physics, Prof. Dr. Anton Ramšak, presented the Faculty Prešeren Awards to the students of the Faculty of Mathematics and Physics. 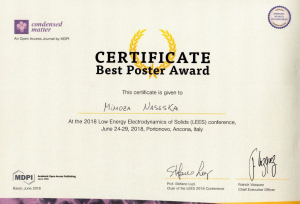 Mimoza Naseska, a young researcher from our department, was one of the recipients of the Faculty Prešeren Award for her work titled “Ultrafast Spin Density Wave dynamics at intense optical pulse excitation”. The work was supervised by Assist. 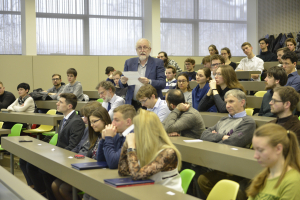 Prof. Dr. Tomaž Mertelj. 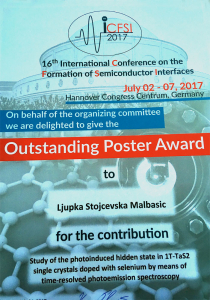 The experimental work for her master’s thesis was carried out at the Jožef Stefan Institute Department of Complex Matter. 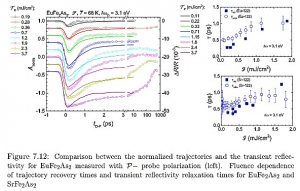 With the multipulse time-resolved optical spectroscopy, she investigated the femtosecond dynamics in iron pnictides with a spin density wave (SDW) state. Using this technique she determined the fluence dependence of the timescale for optical destruction and recovery of the SDW state. 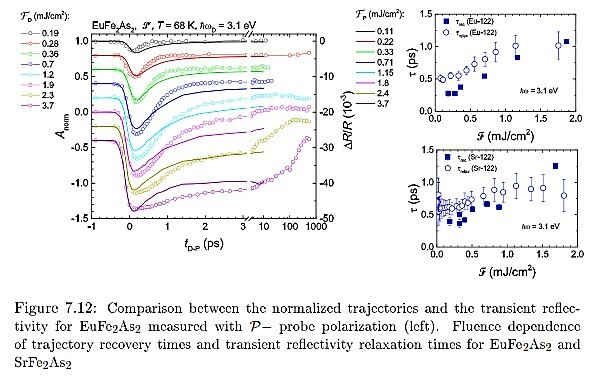 She also found that the measured heating is significantly smaller than expected on the basis of the optical penetration depth data published in literature. 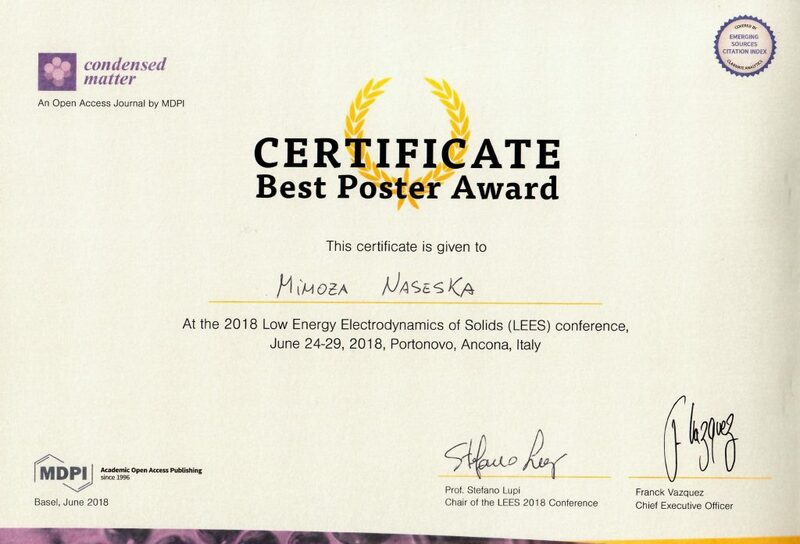 Young researcher Mimoza Naseska was awarded Best Poster Award at the 2018 Low Energy Electrodynamics of Solids (LEES) conference, June 24-29, 2018, Portonovo, Ancona, Italy for poster “Optical quench and recovery of SDW state SeFe2As2 and EuFe2As2”. 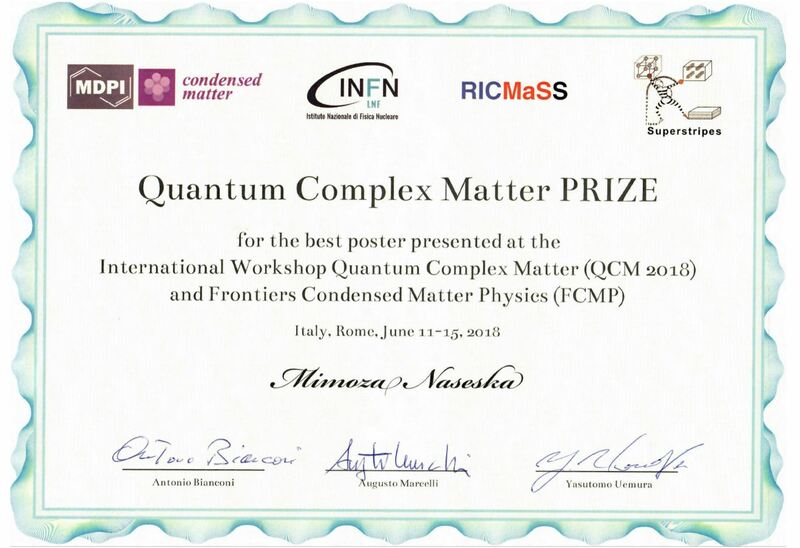 Young researcher Mimoza Naseska was awarded Best Poster Award at the International Workshop Quantum Complex Matter (QCM 2018) and Frontiers Condensed Matter Physics (FCMP), June 11-15, 2018, Rome, Italy for poster “Optical quench and recovery of SDW state SeFe2As2 and EuFe2As2”. 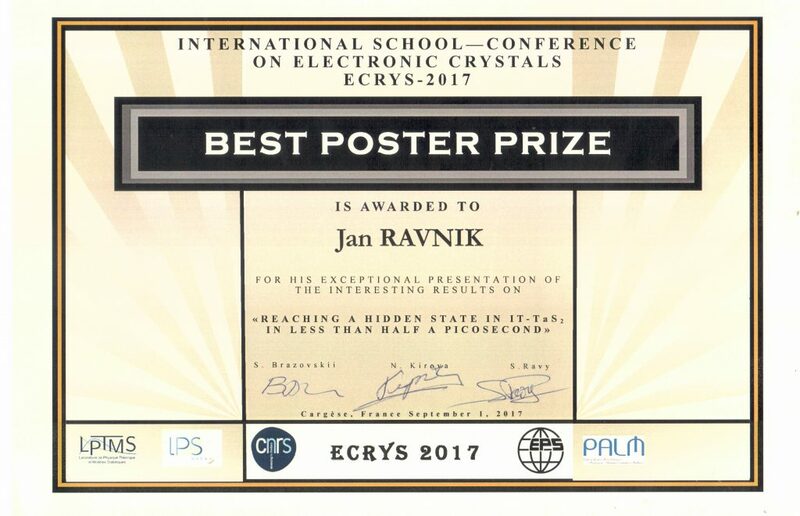 Jan Ravnik received the Best Poster Award at the International School and Workshop on Electronic Crystals ECRYS-2017, for his paper: Reaching a Hidden State in Half a Picosecond. 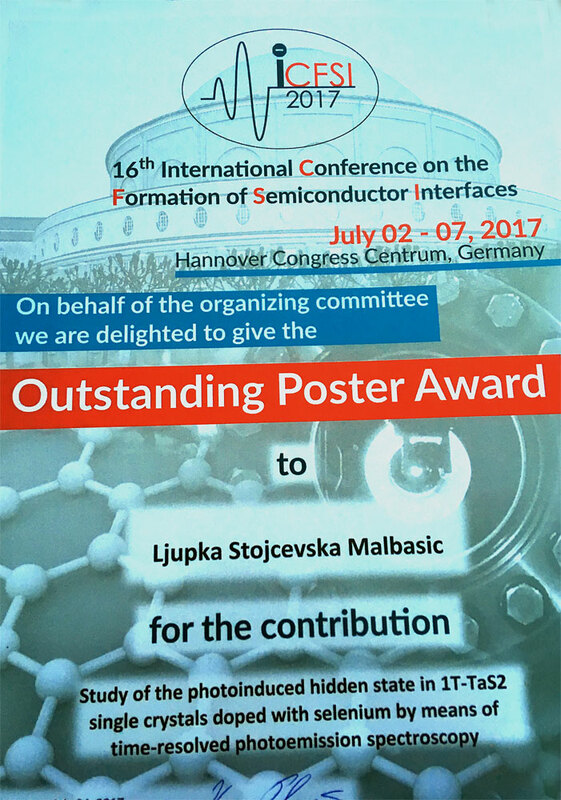 Dr. Ljupka Stojčevska Malbašić received the Best Poster Award at the 16th International Conference on the Formation of Semiconductor Interfaces (ICFSI 2017), for her paper: Study of the photoinduced hidden state in 1T-TaS2 single crystals doped with selenium by means of time-resolved photoemission spectroscopy (Co-authors from JSI; Asst. Prof. Tomaž Mertelj, Prof. Dr. Dragan Mihailović and Petra Šutar). 6. decembra 2016 smo podelili nagrade za najboljše dosežke študentom naše fakultete. Fakultetno Prešernovo nagrado so s področja matematike prejeli Matej Petković, Rok Brence, Blaž Koroša in Petra Poklukar, s področja fizike pa Jan Fišer, Tanja Kaiba in Lara Ulčakar. Nagrado Franca Močnika je dobila Neda Tompa. Dekanova priznanja študentom Fakultete za matematiko in fiziko UL je prejelo 20 študentov z Oddelka za matematiko in 25 študentov z Oddelka za fiziko.